Cut avocados in half and remove seed. Roughly mash flesh in three small bowls, reserve shells for serving. 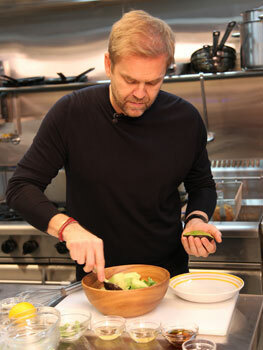 To the first avocado, stir through the juice of one lime, salt and pepper to taste. Spoon the straight-up avocado and lime guacamole back into one of the avocado shells. To the second avocado, mix through tomato, red onion, coriander and jalapeno pepper. Add lime juice, salt and pepper to taste. Spoon the avocado salsa fresca guacamole into two reserved avocado shells. To the third avocado, mix through crushed peas, mint and spring onion. Stir in lime juice, salt and pepper to taste. 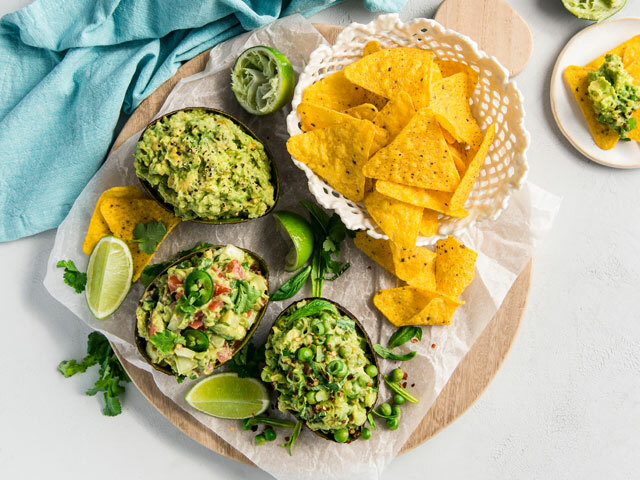 Spoon the avocado, pea and mint guacamole into two of the remaining avocado shells and top with a sprinkle of chilli flakes. Serve guacamole-filled shells with tortilla chips and extra lime wedges. For less clean-up, you can mash the avocado and mix the guacamole straight in the avocado shells! It's been 25 years since avocado toast first smashed its way into our lives, and now the man credited with starting the worldwide food phenomenon is back with a new twist on the popular dish. Iconic Aussie restauranteur Bill Granger first put avocado on a piece of toast and served it at his café in Sydney's Darlinghurst back in 1993. Not only did he launch 'brunch' as we now know it, but he also sparked Australia's great love affair with the versatile fruit. To help Australians celebrate the 25 year milestone, the 'father of smashed avo' has shared his fresh, new avocado go-to dish for 2018 – avocado and smashed cucumber salad with mirin and sesame. "Avocados bring such a wonderful textural contrast to so many dishes. This salad was inspired by classic, simple Japanese summer salads and brings a new flavour to one of my favourite foods," said Granger. "Avocados always take on so many flavours and here, soy, sesame and citrus are natural partners to balance the richness of the avocado. This dish is incredibly versatile, I love it." It's Granger's go-to 'bring-a-plate' at barbeques and he also serves it up with poached or grilled chicken, fish, seafood or rice for dinner. In 1993, Australians were just beginning to dabble with avocado. A decade later we were munching through an average 1.68kg a year, and today the average Australian eats a whopping 3.5kg of avocados each year – making us the biggest consumers of avocados per capita in the English-speaking world. Fuelling Australia's passion for avocados is the fruit's health benefits. Avocados are nutrient dense and an excellent source of good fat, which means they are an easy way to make any meal better. "Avocados are here to stay, the public's love for them just seems to keep going. You won't see another food so passionately talked about and eaten – people are even using them to propose now," said avocado grower and Avocados Australia Board Director, Tom Silver. "Growers are planting new trees all the time. It takes three to four years for a newly planted avocado tree to bear fruit so as an industry we expect production to increase by around 50 per cent by 2025. That will be around 115,000 tonnes of avocados produced a year," he said. Their popularity and versatility has seen them make their way onto café menus and home kitchens in everything from smoothies, pasta, sandwiches, salads, icecream, desserts, even coffee. "Avocado on toast was born because I was looking for something tasty to go with a bloody Mary at breakfast. I added it to the menu and it quickly became a favourite. "Avocado on toast is still my go-to breakfast, with either salmon or poached eggs. It cannot be beaten," he said. Australian Avocados is managed by Hort Innovation on behalf of the nation's avocado growers. Hort Innovation is a not-for-profit, industry-owned organisation that delivers more than $100 million in research, development and marketing activities each year.